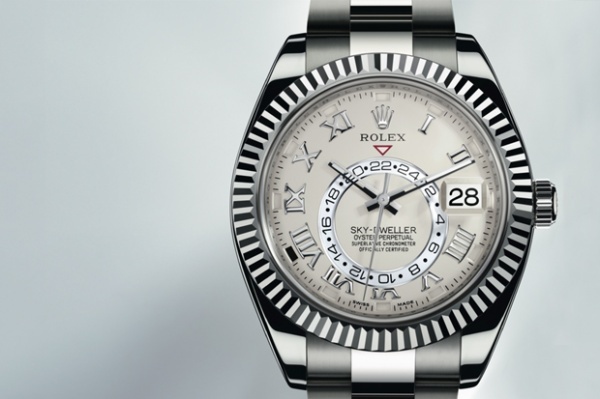 At Baselworld 2012, Rolex announced the upcoming release of a new model, the Sky-Dweller. For a brand that seldom reveals new models, this was pretty earth-shattering news in the watch community. It’s now understood that in addition to the Sky Dweller‘s intuitive dual-time display, the all-new caliber 9001 automatic movement is controlled via the watch’s bezel-operated control ring. This “Ring Command” system enables the wearer to set the date, local time and reference time displayed on the watch — all by rotating the fluted bezel. It’s no surprise that this caliber 9001 movement is Rolex’s most complex to date, as the movement alone contains seven different patents. The Sky-Dweller isn’t expected to hit authorized Rolex dealers until sometime this winter, so you’ll still have a bit of time to scrounge together the $46,000 USD it’ll take to get the 18K yellow gold Dweller on your wrist. You can find more information, and stay abreast of any updates at the Rolex Sky-Dweller page here. This entry was posted in Accessories and tagged 2012, Ring Command, Rolex, Rolex Sky Dweller, Sky Dweller, USD, winter. Bookmark the permalink.